Please note below is a tentative itinerary for your trip. The actual may vary depending on the inclusions selected in the trip. Upon your arrival, and meet and greet with our representative at Leh Kushok Bakula Airport (on a clear day, from one side of the aircraft can be seen in the distance the peaks of K2, Nanga Parbat, Gasherbrum and on the other side of the aircraft, so close that you feel you could reach out and touch it, is the Nun Kun massif), you will be transferred to your hotel. Check in, get comfortable, and acclimatize to your splendid new surroundings. Take the edge off by spending your day in leisure. In the evening, do some local sightseeing. 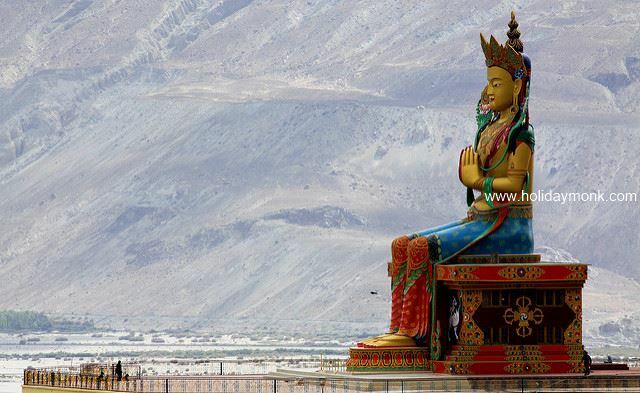 SITES VISITED: majestic Leh Palace, Buddhist monastery Shanti Stupa & Leh Market. Overnight at Hotel. After breakfast today, get ready for a day-long excursion to Sham Valley. Start to drive downstream along river Indus on Leh – Kargil Highway. Visit Hall of Fame (museum constructed by the Indian army) and Gurudwara Patthar Sahib on your way, and as you move ahead from Magnetic Hills (gravity hill alleged to have magnetic properties), just before Nimmu Village, you will be greeted by the famous confluence of the two rivers of Indus (coming from Tibet on the left) and Zanskar River from the Valley on the right. After visiting the places above, we drive back to Leh, visiting Spituk Monastery(built in the 15th century as a fortress on the summit of crags) en route. Evening at leisure. Overnight stay at your hotel in Leh. After breakfast at your hotel in Leh today, we drive to the ‘valley of flowers’ Nubra Valley (120 kms/4-5 hrs). After you hit the road, your journey to Nubra Valley passes over Khardung La (5602 mts, 18,390 ft, 39 km from Leh) – the highest motorable road in the world. From the pass, one can expect stunning views of Indus valley and the seemingly endless peaks and ridges of the Zanskar range, and the giants of the Saser massif to the north. 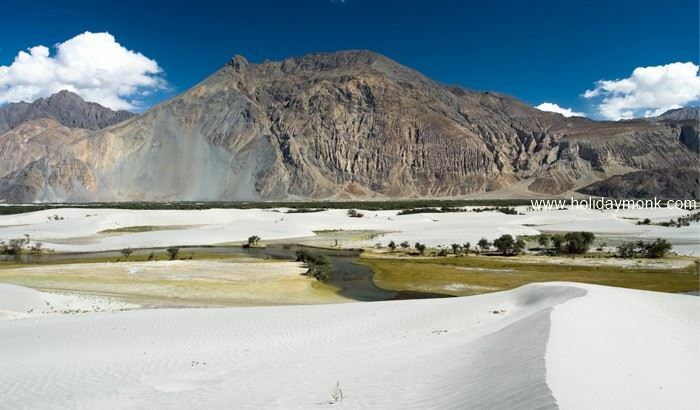 Nubra Valley is situated in the north of Ladakh between the Karakoram and Ladakh ranges of the Himalayas. Upon arrival in Nubra, check in to your hotel/camp in Hunder. In the evening, take a walk around the tiny villages to get an idea of the way locals live. A visit to a Ladakhi home can also be arranged. Overnight stay at camp/hotel in Leh. After an early breakfast, we check out from your camp in Nubra Valley and drive to Hunder where you have opportunity go on joy rides with a bactrian camel amidst the white sand dunes of this high altitude desert. Hunder, which falls on the historic Silk Route, used to be a busy trade stopover with caravans of Bactrian camels moving in and out of the Nubra Valley. The Bactrian camels are large even-toed ungulates native to the steppes of central Asia. It is one of the two surviving camel species. They have two humps on its back, in contrast to the single-humped Dromedary camels. When they aren’t released into their herds and into the wild, the camels are used to take keen tourists around on a unique, memorable trek. Sand dunes that lie between Hunder and Diskit in Nubra Valley have lured many tourists, with the camel safari being the main attraction. Immediately on the left of the road is Rocky Mountains that characterize the Ladakhi lan ds. Also stop at the regional hub of Diskit – the headquarter town of Nubra Valley – and visit the famous 515 year old Buddhist monastery. Take a lovely stroll around the bazaar observing the locals and their fascinating ways of going about their lives. On your way to Leh, you will be going over Khardung La Pass. Check in to your hotel/camp in Leh on arrival by early evening. Overnight stay at hotel in Leh. After an early breakfast today, check out and leave for Pangong Lake. 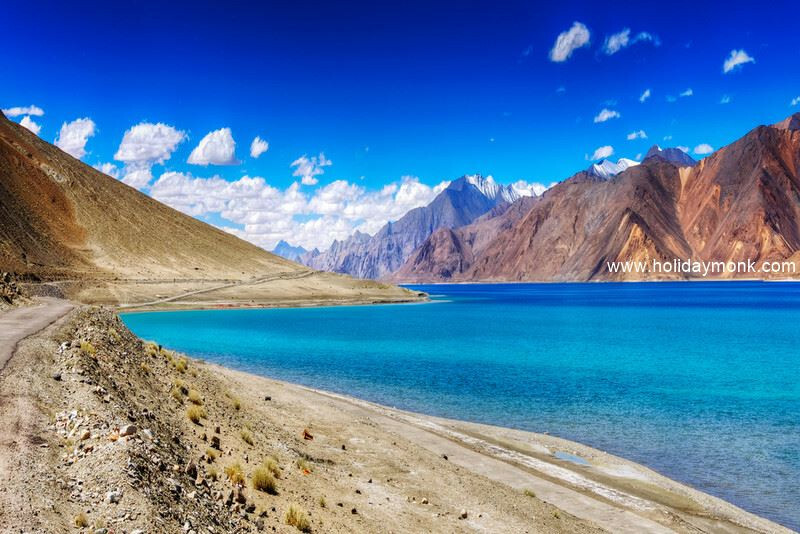 Situated at a height of about 4,350 m (14,270 ft) in eastern Ladakh region, charismatic Pangong Tso can be reached from Leh in a five hour drive on mostly rough and dramatic mountain road. The road crosses the villages of Shey and Gya and traverses the Chang La, where army sentries and a small teahouse greet visitors. 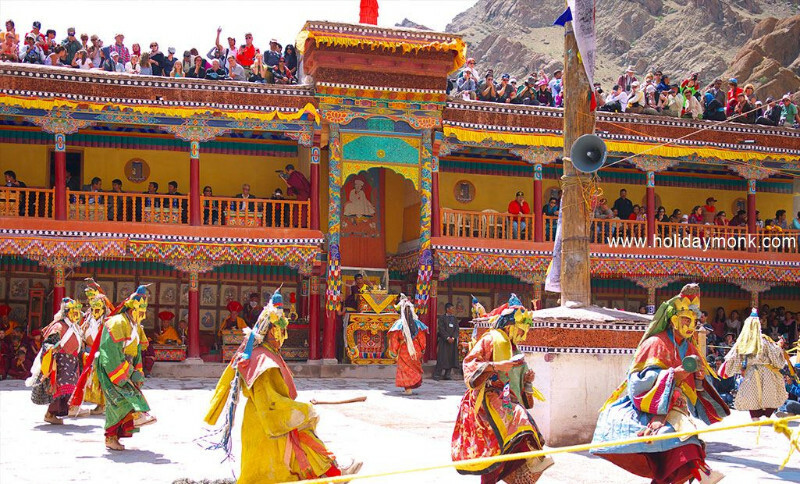 You will be visiting Shey Palace, the ancient capital of Ladakh, and Buddhist monastery Thiksey Gompa 5 kms down a picturesque landscape. After visiting the two monasteries we drive down Chang La Pass (5486 mts). Stop here for some photo ops and drive down to the village of Tangtse, where you can relax for a cup of tea. On your way to Pangong from Tangtse, after passing through a few small villages of Changthang, you arrive at Pangong Lake (14,000 feet). Tibetan for ‘high grassland lake’, Pangong Tso is one of the largest brackish lakes in Asia. You may recognize its timeless beauty from its feature in Bollywood film 3 IDIOTS (2009). This disputed territory and saline water lake is in the process of being identified as a wetland of international importance under the Ramsar Convention. It will be a first trans-boundary wetland in South Asia under convention! At the first glimpse of the azure, tranquil waters and shaky lakeshore, it is hard to imagine that the lake sprawls over an area of 100 kilometers across the borders of India and Tibet. 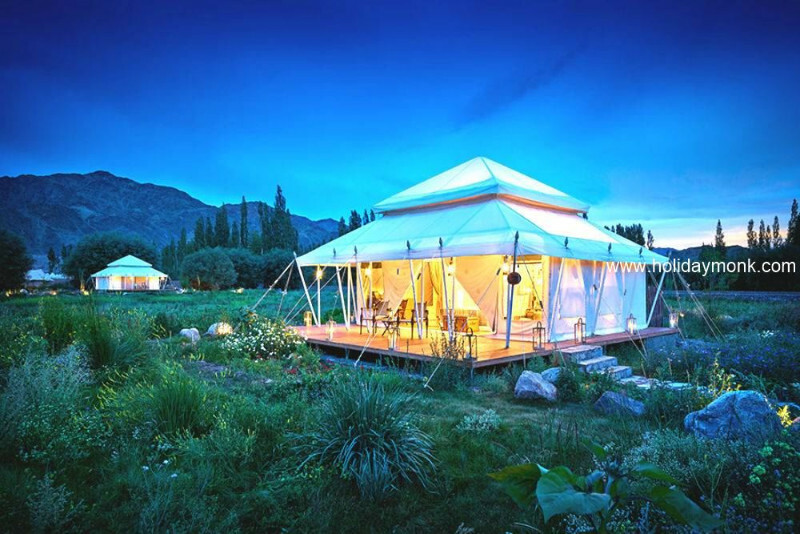 Upon arrival, check in to your camp near Pangong lake and get comfortable. Dinner & overnight stay at camp in Pangong. We hit the road to Leh today, after some time around Pangong Lake. Tibetan for ‘high grassland lake’, Pangong Tso is one of the largest brackish lakes in Asia. You may recognize its timeless beauty from its feature in Bollywood film 3 IDIOTS (2009). This disputed territory and saline water lake is in the process of being identified as a wetland of international importance under the Ramsar Convention. It will be a first trans-boundary wetland in South Asia under convention! At the first glimpse of the azure, tranquil waters and shaky lakeshore, it is hard to imagine that the lake sprawls over an area. After a morning of leisure and relaxation exploring the beauty of Pangong Lake, hit the road to Leh. 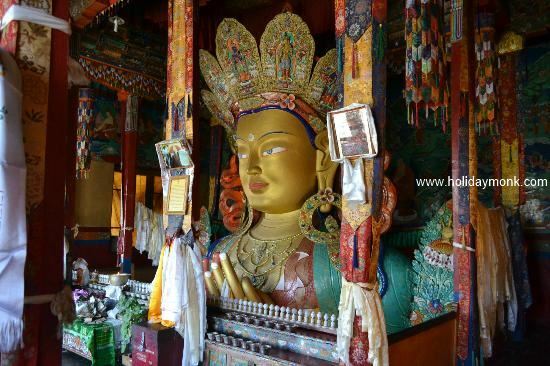 En route, visit Hemis Gompa, the largest monastic foundation of Drukpa Kagyu Order of Tibetan Buddhism. Drive further until you reach Leh. Check in to your hotel and get comfortable. In the evening, take an indulgent stroll around the mark etplace for last minute souvenir shopping, if you wish. After breakfast today, check out from your hotel in Leh. You will be transferred to the domestic airport to catch your flight back home. Your tour has come to end. Let the memories begin! From 1st April 2017 onwards Environmental Fee and Red Cross Fee of Rs. 700 per person has to be paid by all travelers directly when you arrive at Leh. You need to pay 25% now to reserve your trip. Once reserved if there are flights included, then you need to pay 100% of flight cost within 3 days of booking. The balance payment needs to be completed 21 days prior to your travel or once everything gets confirmed (whichever is earlier). You can pay using credit cards, debit cards, net banking or deposit cash to our bank accounts. TripFactory is not responsible for any changes in trip arising because of unforeseen circumstances (weather, flight delays or cancellations, natural calamity etc.) which is beyond our control and all costs arising out of it will be borne by the customer. Approx Rs 18000 per person and does not include Flight chanrges.